Published: Aug 31, 2017 · Modified: Apr 12, 2019 · By Jen Sobjack · This post may contain affiliate links. The best white cake recipe is made from scratch and must be added to your collection of cake recipes. It’s so moist, light, and tender. Whipping egg whites to soft peaks and folding them into the batter is what gives the cake it’s phenomenal texture. The batter is then flavored with hints of almond and vanilla extracts. 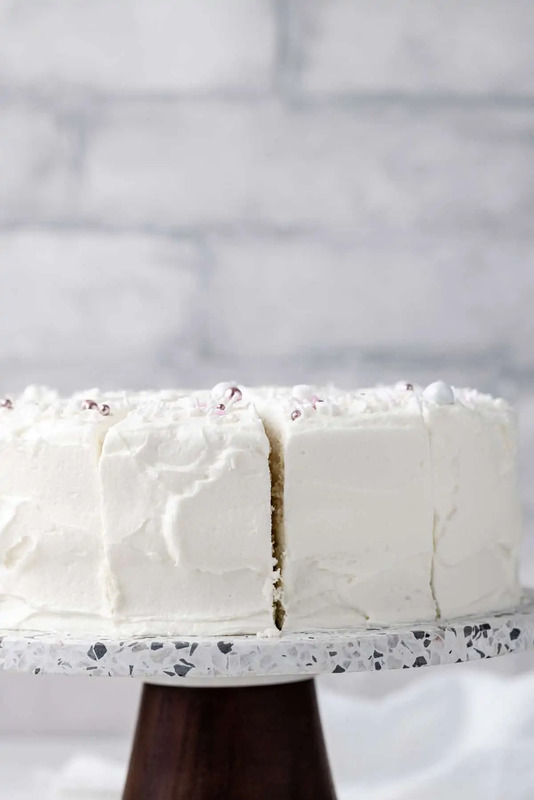 Vanilla buttercream with the addition of almond extract is the perfect way to frost the cake. 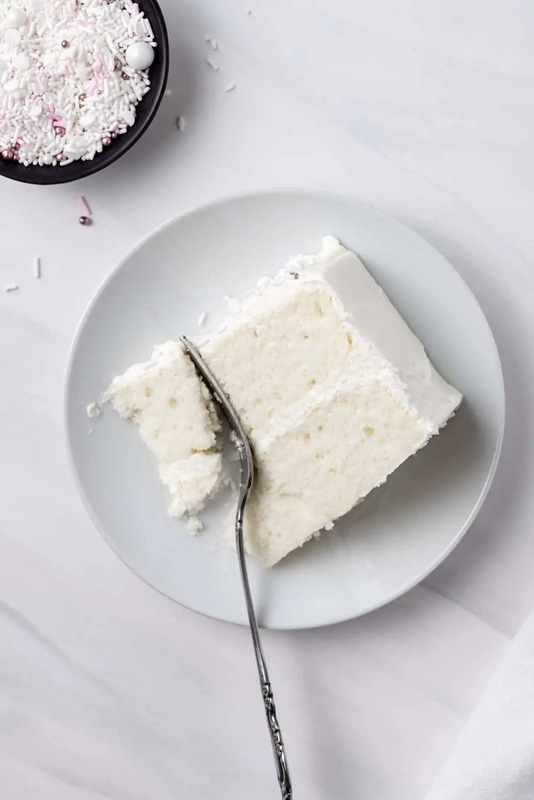 This truly is the best white cake recipe you’ll ever try. Baking a white cake that’s full of moisture and has a soft and tender crumb isn’t all that difficult. It’s really not much different than making my basic vanilla cake, which I must say, is my most popular recipe. It’s tried and true! Just take a look at all the photos from everyone who’s tried it on Pinterest. 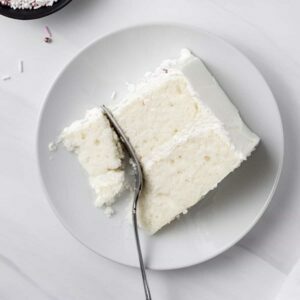 I took all the concepts I learned through making the perfect vanilla cake and used them to create the Best White Cake Recipe. I know so many of you hate the word moist, but how else am I supposed to describe a cake that is so far from dry, it sticks to your fork. It all starts with room temperature ingredients. Set the eggs, butter, and buttermilk out on the counter for at least an hour before you begin to make the cake. Cream the butter and sugar together for a good five minutes. You want it to be light, fluffy, and double in volume. This is so important for a fluffy cake. Use only the egg whites. The extra fat in the egg yolks will weigh the cake down. It’s not a terrible thing. I use whole eggs in my vanilla cake recipe. But, the egg whites do yield a lighter texture. Whipping the egg whites to soft peaks and folding them into the batter at the very end will ensure the cake stays light and airy. Think of how soft chiffon cakes and angel food cakes are. They use this same method for incorporating egg whites. Cake flour is necessary for this recipe. Do not use anything other than that! The low protein content in cake flour means less gluten development which is only going to enhance the soft texture of the cake. Cake flour can be found in the baking aisle with all the other flours. If for some reason you can’t find it, here’s how to make homemade cake flour. When mixing the ingredients together, don’t over mix. Mix just until the ingredients are incorporated. Any longer than that and you’ll start the process of gluten development which will yield a denser, tougher cake texture. 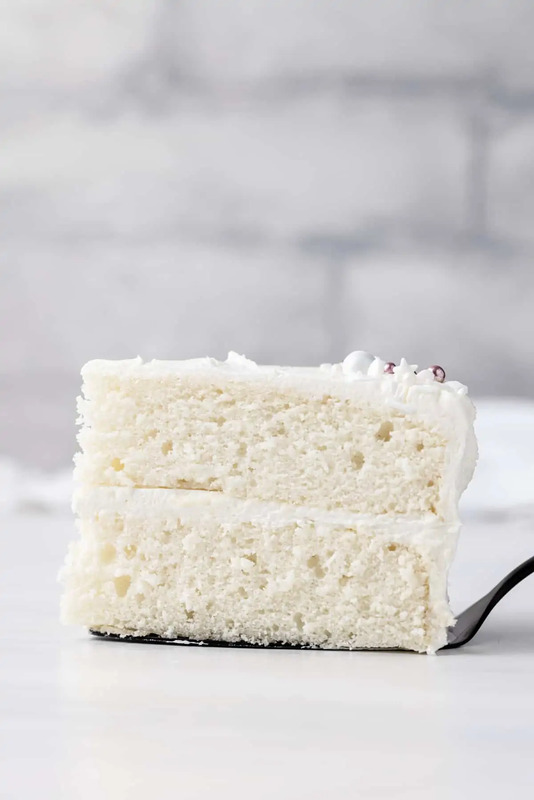 How to keep homemade white cake moist? Don’t overbake the cake! Leaving the cake in the oven any longer than needed will dry it out. Use a toothpick or wooden skewer to test the doneness of the cake. If the toothpick comes out with wet batter on it, it needs more baking time. If the toothpick comes out with a few moist crumbs on it, it’s perfectly baked and needs to be removed from the oven. If the toothpick comes out completely clean, I’m sorry to say, you’ve overbaked the cake and it will be dry. It’s always best to start checking the cake 5-7 minutes sooner than the bake time listed in the recipe. Follow all these tips for how to make the perfect cake and the result will be a fabulously tender and light, buttery cake. Nothing beats a homemade cake that’s better than a bakery! There are no substitutions with the base of this white cake recipe. However, you can omit the almond extract or replace it with any other flavor extract or essence. 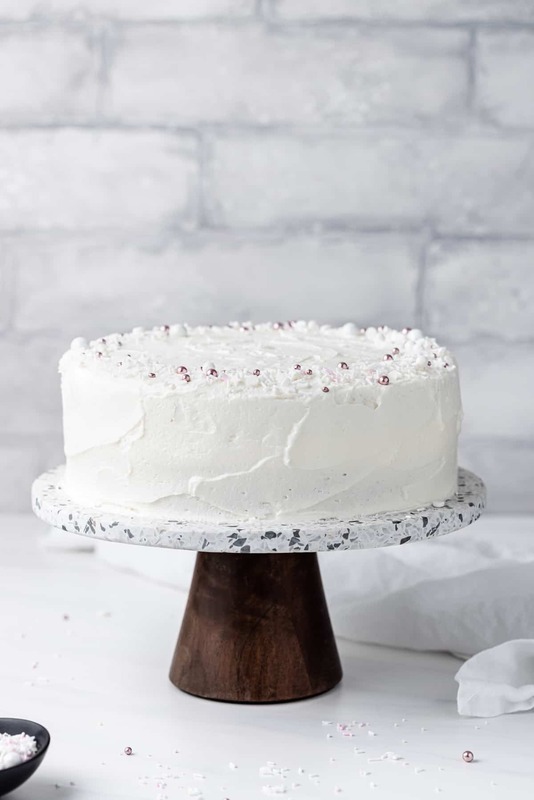 Frost the cake with vanilla buttercream that also has a hint of almond and you’ve got one dreamy, homemade white cake. This made from scratch Moist White Cake recipe is one that must be added to your collection of cake recipes. It’s so moist, light, and tender. Preheat the oven to 350°F. Grease and lightly flour 2 9-inch round cake pans; set aside. In a large bowl, beat the egg whites with an electric mixer on medium speed until foamy. Gradually add 1/2 cup of the sugar while the mixer is running. Turn the mixer up to high-speed and whip the egg whites to soft peaks. Set aside. In a separate large bowl, beat the butter and sugar together until light and fluffy, about 5 minutes. Beat in the vanilla and almond extracts. Combine the flour, baking powder, and salt in a medium bowl. Stir with a whisk and add it to the butter mixture alternately with the buttermilk, beating well after each addition. Gently whisk 1/3 of the egg whites into the batter. Using a rubber spatula, gently fold in the remaining egg whites until well combined. Divide the batter evenly between the prepared pans. Bake for 20-30 minutes or until a toothpick inserted into the center comes out with a few moist crumbs. Take care to not over-bake. Check the cake at 15 minutes to see how it is doing and judge the timing from there. Cool for 10 minutes. Remove from pans and cool completely on a wire rack. Make the frosting according to the directions and mix in 1 teaspoon almond extract. Bake the cake in 3 8-inch round pans for 15-25 minutes, 24 muffin cups for 15-18 minutes, or a 9×13-inch pan for 30-35 minutes. If you wish to make changes other than these, please consult this guide for how to convert pan sizes. You can omit the almond extract or replace it with any other flavor extract or essence. 1. Make sure to use room temperature ingredients. Cold eggs will be difficult to whip up to soft peaks. 2. Measure the flour by lightly spooning it into the measuring cup then level the cup with the back of a knife. Or use the weight measurement listed in the ingredients under the “metric” tab. 3. If you don’t have cake flour, you can make Homemade Cake Flour. 4. Start checking the cake 5-7 minutes sooner than the bake time listed. If the toothpick comes out with wet batter on it, it needs more baking time. If the toothpick comes out with a few moist crumbs on it, it’s perfectly baked and needs to be removed from the oven. If the toothpick comes out completely clean, I’m sorry to say, you’ve overbaked the cake and it will be dry. 5. If making the basic buttercream frosting and you want it to be stark white, mix in a few drops of white food coloring.